How are you all doing? Thank goodness the heat has broken a bit, I really didn't know how many more 100 degree days I could handle. One good thing we've got to look forward to is that Saturday Septemember 22 is the Autumnal Equinox or first day of Fall, let's all hope this brings us much more comfortable temps. This will also mean that the days will be getting shorter, now that will be a little sad but I'll take it. Also, I'd like to let everyone know that we've got a bunch of new pics from recent car shows up on our website now and also some really cool videos, so be sure to check them out at www.caeperformance.com Just click the SHOW GALLERIES tab for slideshows of car shows or scroll down our HOME page to our YOUTUBE button and click that to go to our SPEED SHOP channel. Here are some "save-the-date" shows coming in October so mark your calendars. On Sunday Oct 7 is the 7th Annual Truckin' for Kids at the Irwindale Raceway. The event will be a Show & Shine starting at 8am, Pick Up Drags at 12noon, Jr Dragsters at 12:30pm and Big Rig Drags at 1pm. They will also be holding a "Light The Lot" event there on Saturday night Oct 6. General Admission will be $15 and include a pit pass, kids under 12 are free. Go online to www.truckinforkids.org Also on Sunday Oct 7 is the 22nd Annual Veterans Memorial Car Show at the Jerry L Pettis Memorial VA Medical Center in Loma Linda from 8am-3:30pm. This is a very large show and will start with a pancake breakfast and include a coloring contest, model car contest, scavenger hunt, and will feature live music by KOLA 99.9FM radio. Check out the details at www.veterancarshow.com On Saturday Oct 20 is the 3rd Annual Car, Truck & Bike Show in Chino presented by Boy Scout Troop 309. This show is open to Classics, Customs, Street Rods, Rat Rods, Trucks, Muscle Cars, Lowriders, Special Interest, Motorcycles, Choppers, Bobbers, and Working Show Trucks. This is a great local show and would be a great place to show your car if you're just starting out. All proceeds go to fund local Boy Scout Troop 309 in Chino. If you are interested in participating please stop by our location and pick up an entry form. On Sunday Oct 21 is the American Classic Car Show at the NHRA Museum in Pomona from 8am-2pm. Please no Motorcycles, Mini's, Lowriders or Foreign Cars. On Saturday Oct 27 is the Fall Harvest Cruise 2012 at the NHRA Museum in Pomona from 12pm-4pm. This show is open to all 1978 and older Cars, Trucks, Classics, Street Rods and Imports. The show will be hosted by Golden West Car Club and we are a sponsor of this event. We are proud to have Golden West Car Club on our website, you can check them out under the CLUBS tab. You can also check out their club website at www.goldenwestcarclub.com (their site gives a different date for this show, but I have verfied that Oct 27 is the correct date) Also on Saturday Oct 27 is the 10th Annual Pumpkin Patch Car Show at Heritage Park in La Verne from 10am-3pm. The show is open to all Pre1975 Cars and Trucks and features hay rides, face painting, live music and of course a pumpkin patch so you and the kiddies can pick out that perfect Halloween Jack-O-Lantern. For more details go to their website at www.laverneheritage.org/files/2012 Car Show Flyer Color.pdf On Sunday Oct 28 is the 27th Annual Memorial Park Car Show at Upland Memorial Park from 8am-2pm presented by the Baldy View Regional Group. This show is open to all Pre-80's Cars, Trucks and Street Rods. This is also a club that we are proud to have on our webite. 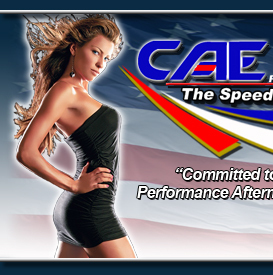 If you have a show or event coming up and wouls like me to include it in my newsletter all you need to do is email me at caeperformance@aol.com and I'll get your shows info out there. You can also drop off flyers at our location so our counter customers hear about your event. You can also contact me through our FACEBOOK fan page, our GOOGLE+ page and watch for "check-in" specials on our FOURSQUARE and YELP page.